Southern Illinois University Carbondale’s College of Business celebrated and recognized its outstanding seniors from every department April 9 at its annual Honors Day. These students have shown great promise during their time at the College of Business and were noted for their efforts by their respective departments. Each department selected its outstanding senior based on a number of criteria, ranging from academic achievement and high GPA to active involvement and service to the department. Noppadol “Champ” Tuksakulvith, the Department of Management’s outstanding management senior. Tuksakulvith is the president of SIU’s American Production and Inventory Control Society (APICS) chapter, and he spearheaded its formation in spring 2015 by preparing the paperwork required to initiate this registered student organization (RSO) at the university. One of the notable achievements for Tuksakulvith and the APICS team was placing fourth in this year’s annual Great Lakes District Student Case Competition. In addition to his involvement with APICS, Tuksakulvith is a mentor in the Department of Management. He said he plans to either go to graduate school, or to start a full-time or intern position. Tuksakulvith has applied to SIU’s Master of Science in Quality Engineering Management program, as well as to the Master of Science in Supply Chain Management programs at the University of Texas at Dallas and Nayang Technological University in Singapore. 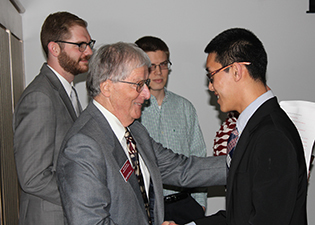 The School of Accountancy named Shaobo “Jerry” Zhang as its outstanding accounting senior. Zhang is president of the SIU chapter of Ascend, an RSO dedicated to enhancing the presence and influence of current and future business leaders of Asian and Pacific Islander descent. During his time in Ascend, Zhang put together several programs for the School of Accountancy as part of the RSO’s efforts to enhance the Pan-Asian business culture within the College of Business. These programs included a LinkedIn workshop, a Microsoft Excel workshop and many others. Zhang said he plans to go to graduate school and then become a certified public accountant. He said he hopes to work for a Sino-American firm. Joshua Lohman, who is obtaining a dual degree in accounting and finance, was chosen as the outstanding senior in finance. His primary involvement at the College of Business is being coordinator of the SIU Accounting Challenge, an annual event that attracts nearly 350 high school and community college students interested in accounting. Lohman also is active in the Accounting Society, the Illinois CPA Society and the SIU Honors Program, in addition to being a Catholic Youth Ministry leader and an Eagle Scout and assistant scoutmaster for the Boy Scouts of America. By applying his knowledge and background in finance, Lohman supported the Achieve program in providing assistance to students with learning disabilities who are interested in finance. Lohman has accepted a position as an audit associate at KPMG, a “Big Four” accounting firm in St. Louis, and will begin his professional career after graduation. Lohman’s long-term goals are to become either a chief financial officer of a corporation or a partner at KPMG. The Department of Marketing named Trevor Pederson as its outstanding marketing senior. Pederson joined Pi Sigma Epsilon, a national co-ed fraternity for sales, marketing and management, in spring 2013. He has a track record of progressive leadership experience within the SIU chapter of the fraternity. In his second semester at Pi Sigma Epsilon, Pederson become its recruitment chair; a semester after that, he became its executive vice president; and, by the spring of 2015, he was the fraternity’s acting president. He also rushed Phi Kappa Tau fraternity in spring 2015 and was initiated later that year. Pederson says that his plans include working in sales in Colorado, ideally in the area around the city of Fort Collins. The online Business and Administration degree completion program honored Charity Worthen as the program’s outstanding business and administration senior. A former student of SIU embarked on a career in radiography and computed tomography (CT). She has held various positions in that occupation, including the role of lead CT technologist and safety coach. Worthen said the program allowed her to further her education from a business standpoint. With her new degree and professional experiences, she plans to advance her career in health care by achieving a supervisory position in radiology. Honors Day also featured the outstanding senior in the College of Business award. This year, Noppadol “Champ” Tuksakulvith was the lucky recipient of this honor. The College of Business congratulates all the outstanding seniors and wishes them the best of luck after graduation!